Polar bears are now eating dolphins. 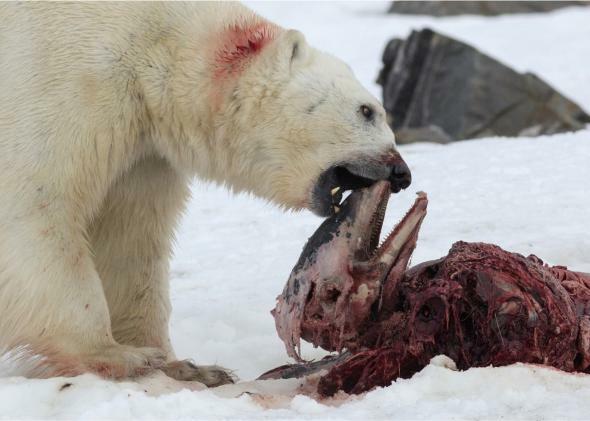 A male polar bear is photographed next to the carcass of a white-beaked dolphin on April 23, 2014. The Norwegian Polar Institute first came across the phenomenon in April 2014, when a polar bear was seen eating two dolphins. Jon Aars, the lead author of the study, tells the AFP that it’s likely the bear managed to kill both dolphins when they had surfaced to breathe through a hole in the ice. “Even if they saw the bear, the dolphins did not necessarily have any other choice,” he said. Interestingly enough, Aars and his team observed how the polar bear ate one dolphin and then appeared to try to hide the second one in what looked like an effort to save it for later. “Such caching behaviour is generally considered untypical of polar bears,” they wrote. 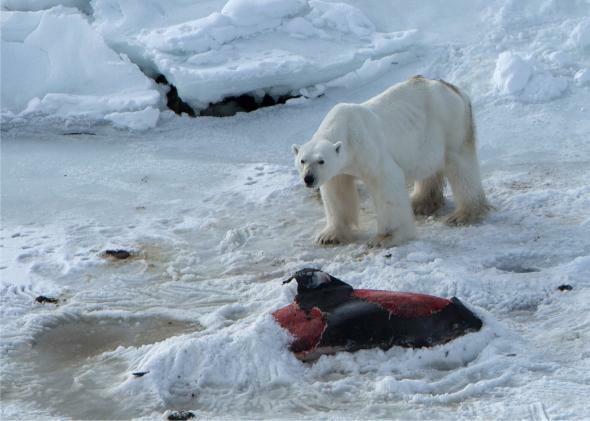 An adult polar bear feeding on the remains of a white-beaked dolphin on July 2, 2014. Although dolphins are a regular sight in the Arctic summer, the fact that they’re so far north in the winter shows the effect of the rapidly retreating ice. And while it may not be good news for dolphins to be part of the polar bear food chain, it’s certainly good for the polar bears to have something new to eat considering there are fewer and fewer seals—also thanks to global warming.